Have you ever entered a Chinese restaurant and upon seeing an aquarium stocked with large colorful Koi fish thought to yourself, “What’s the deal with that? !” The answer to your question dates back more than a thousand years to when cold-water carp were first selectively bred in China for their color. Since then, Koi have come to symbolize wealth, good fortune and prosperity – all things any self-respecting restaurant should aspire to achieve. And now the Koi fish serves as the theme of the latest release in Australia’s Figure Eight series of silver antiqued coins. Struck by Australia’s prestigious Perth Mint in two ounces of 99.99% pure silver, the 2019 Figure Eight Koi Fish Silver Coin is only the second release of its kind, joining 2018’s extremely popular Figure Eight Dragon Silver Coin. Shaped like a figure eight complete with two open holes, the coin’s reverse features a pair of Koi fish swimming against the currents along with a lotus flower – symbols rife with vivid imagery that pay tribute to China’s rich cultural heritage. To augment the design, the coin has been given a unique antique finish – a subtle layer of surface abrasions that gives it the look and feel of an ancient artifact. Aside from its mystical attributes, the Koi is a very hearty fish that has a lifespan of between 100-200 years. The oldest Koi on record lived to be 225 years old! They also grow at a rate of 2 centimeters per month and can reach more than three feet in length. So, getting back to the Chinese restaurant question, the addition of a Koi aquarium not only represents wealth and prosperity, but also suggests that the restaurant has been around for many years and therefore must enjoy steady business due to its excellent service and delicious food – but that’s up to you to judge! While you’re debating the merits of your favorite Chinese restaurant, why not add this innovative silver coin to your collection. The coin is meant to be lucky because both the number eight and the Koi symbolize good fortune. For any collector looking for a little luck, this 2019 Australia Figure Eight Koi Fish Two-Ounce Silver Antiqued Coin is a great choice. But don’t press your luck, just 3,888 of these coins have been struck in 2019 – less than half the mintage of the 2018 Figure Eight Dragon Silver Coin! And in this offer, you can secure it in flawless Mint State-70 (MS70) First Releases (FR) condition encapsulated with an exclusive Sydney Opera House label! LASTEST RELEASE IN FIRST EVER FIGURE 8 COIN SERIES – This 2019 Figure Eight Shaped Koi Fish Antiqued Coin is second release in the world’s first figure 8 shaped coin series. It features a pair of Koi fish swimming against the currents along with a lotus flower. The coin’s obverse features a tiny portrait of Queen Elizabeth II along with the coin’s weight, purity, year date and denomination. STRUCK IN HIGHLY-PURE SILVER – Each 2019 Figure Eight Koi Fish Silver Antiqued Coin was struck by Australia’s Perth Mint in two ounces of highly-pure 99.99% fine silver. 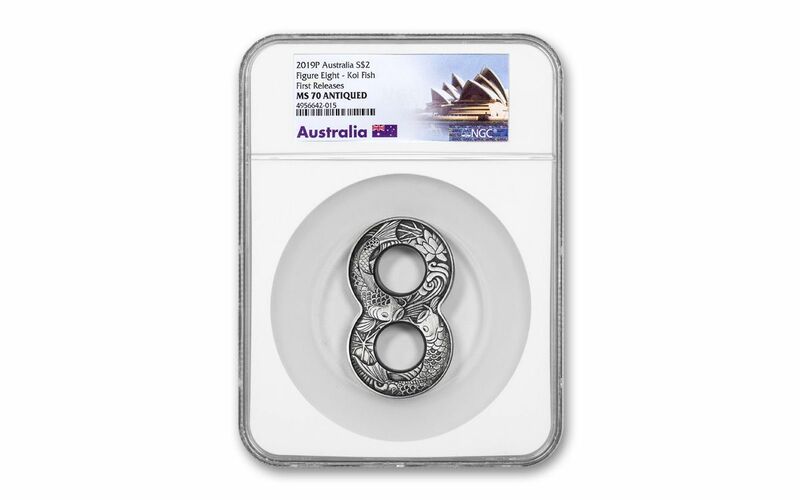 AUSTRALIA LEGAL TENDER – These 2019 Figure Eight Koi Fish Two-Ounce Silver Antiqued Coins are $2 legal tender in Australia, as noted in the lower right of the obverse. 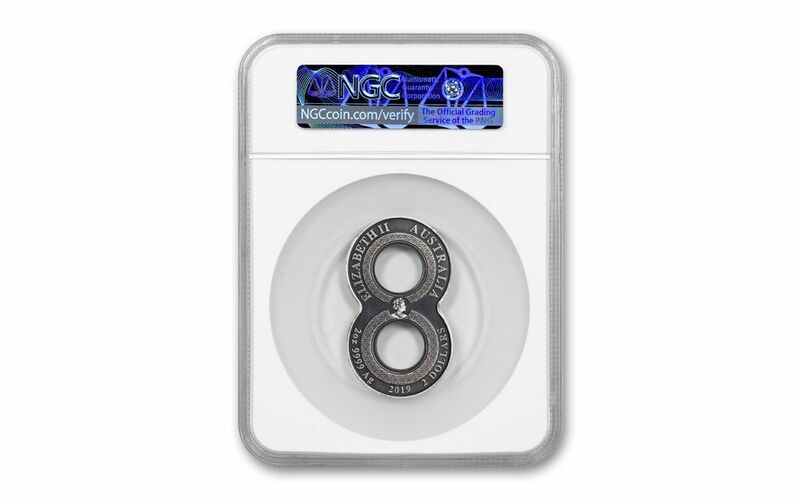 GRADED IN PERFECT UNCIRCULATED CONDITION – Your 2019 Australia Figure Eight Koi Fish Two-Ounce Silver Antiqued Coin has been graded by the Numismatic Guaranty Corporation (NGC) as being in flawless Mint State-70 (MS70) condition, a distinction that means your perfectly-graded coin will have ZERO imperfections – showing all features and fields exactly as the engraver and mint intended. KEY FIRST RELEASES CERTIFICATION – NGC has graded your coin to be a First Releases (FR) coin, a designation that means it was received by NGC or an NGC-approved depository within the first 30 days of its release. I will also come sonically sealed in an acrylic holder with an exclusive Sydney Opera House label and accompanied by a numbered certificate of authenticity. A LIMITED MINTAGE – Fittingly for a coin shaped like a figure 8, this coin has a maximum mintage of just 3,888 pieces – that’s less than half the mintage of the inaugural Dragon Figure Eight coin released in 2018. This unique coin is sure to draw the attention of avid collectors and casual observers alike with its combination of artistry and numismatic execution. While the innovation of the Perth Mint seems unlimited, your opportunity to own this unique 2019 Australia Figure Eight Koi Fish Two-Ounce Silver Antiqued Coin is not, so order yours now at GovMint.com!